This post contains affiliate links. See our disclosure policy for more information. Most people overspend on food simply because there are too many options at the grocery store. Think about what our ancestors ate: meats, vegetables, breads, soups, etc. They kept it simple because they didn’t have a lot to choose from. If we take a page from history and limit our dining options as our grandparents probably did, then we’ll end up healthier and be able to save a lot of money in the process. Speaking of saving money, if you’re interested in getting cash back on grocery purchases that you’re already buying such as milk or produce then you’ve got to check out IBOTTA and Checkout 51. I use these apps regularly to save money on my grocery bill. No coupons needed. 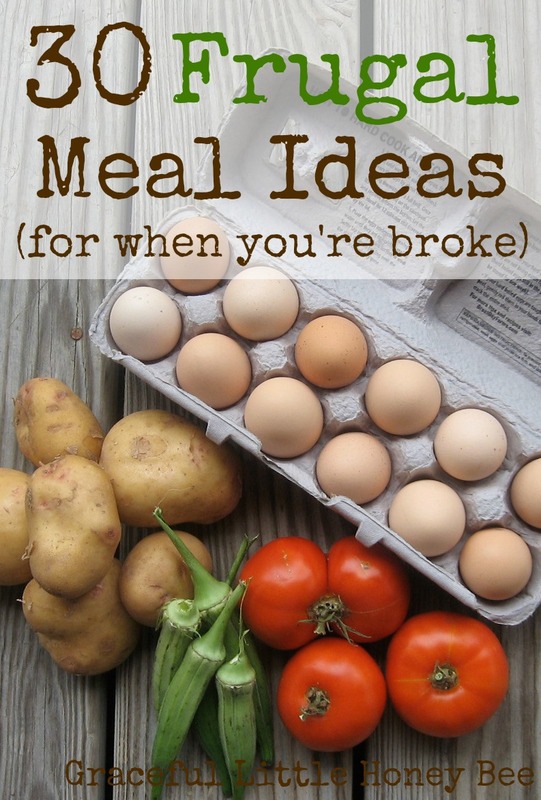 Now on to the frugal meal ideas! I hope you’re inspired by this list to keep your meals simple and save some money in the process. What meal ideas would you add? Haluski...noodles mixed with fried cabbage,onions abd butter. You could add fried sausages and potatoes...but haluski is great on its own. Goulash! It feeds a crowd or can be eaten on for a few days and it's cheap and easy to make! Great ideas -- breakfast for dinner is definitely a go-to in my house. Morning breakfasts are usually skipped or just something quick like granola bar or fruit, but for breakfast for dinner I do scrambled eggs w/ veggies or frittata. What a helpful list! Thanks. I am new to checking out your site. You have a wealth of information and tips. Thanks for sharing. Are you a fan of quesadillas, or would you consider them to be too pricey with cheese being a main ingredient? Quesadillas are great frugal option! VEGETABLE SOUP Brown a lb of hamburger meat and 1 chopped onion then add 1 can veg-all 1 can corn 1 can carrots 1 can beans of choice 1 large can crushed tomatoes 1 can tomato sause 2 cups water Season to taste Bring to boil and simmer 30 minutes Eat with cornbread. Yum yum DO NOT DRAIN CANS OF VEGGIES. One of our meals is egg gravy on toast. You make a gravy base with a stick of butter and about 3 heaping tablespoons of flour.Add about a quart of milk, onion powder,garlic powder and salt and pepper to taste. Just before it becomes thick add about 8 diced hard boiled eggs. Serve on toast.Everyone in my home that has tried it likes it! How do I become frugal with a gluten allergy. Gluten free is so expensive and we're trying to do low carb which is even more expensive because we're already way over weight and can't afford health wise to live off of rice and potatoes. Any ideas would be greatly appreciated. I would focus on the less expensive meats such as chicken thighs and also the cheaper vegetables like carrots. You could also buy lots of frozen vegetables as they tend to be pretty inexpensive. Soups make a whole meal and are healthy without costing much. Also, try buying in season and choosing gluten free grains such as rice and oats. You can also swap out pasta for spaghetti squash. Hope this helps! Maybe some other commenters can chime in with more tips for you. I grew up often eating "spaghetti with tunafish." Basically saute a can of tuna in some butter and olive oil, and add a bunch of dried oregano. In the meantime, make a pot of spaghetti. When the spaghetti is done, turn off the heat on the tuna and add a chopped clove of garlic. Pour the tuna on the spaghetti and serve with parmesan cheese. Fast, easy, and filling. I also love to make egg rice -- brown rice toasted in a skillet and I scramble an egg into it. If I have leftover veggies I'll toss those in too, but it's fine plain! I shred leftover chicken and mix it with Greek yogurt and curry powder, and we'll eat that on toast, too. :) This is a helpful list, thank you! eggs are very frugal. I need a protein at breakfast so I will often eat a hard boiled egg with a dash of hot sauce or 2 deviled eggs. sometimes I'll add a slice of dry wheat toast and my mug of plain tea. I'm full until lunch time. I also shop at a butcher shop where I can get just 1 chicken thigh or a 1/2 pound ground beef. sometimes I'll buy 4 shrimp for a fried rice dish. I'll coursely chop the shrimp and add. To save even more money,shop at Aldi or Sav a Lot. Awesome post! I love these ideas. So healthy and economical!!! Best of all..... so simply to make and follow.